Designed for ice cream shops, concession stands, diners, restaurants, and bakeries, this versatile cup is perfect for serving take-out ice cream, frozen yogurt, and other menu favorites. In addition to its sturdy paper material, the cup's interior features a polyethylene coating for outstanding leak resistance. Plus, it is disposable for easy cleanup after use. 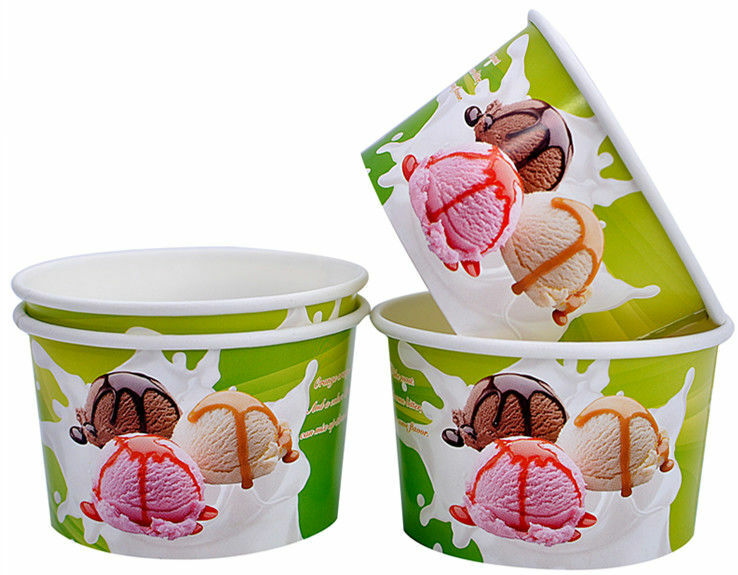 Branded Disposable Ice Cream Paper Cups are manufactured from minimum 260 gsm single wall paper board which provides a very good strong cup, ideal for freezing, keeping your ice cream fresh and yet unfrosted. They are ideal for holding ice cream, frozen desserts, ice cream snacks, yogurts and slush type drinks. Branded paper cups effectively build and promote your brand in the marketplace, increase your sales, and results in better brand image and customer engagement with custom printed ice cream tubs. These disposable gelato cups come in sizes from 3oz to 16oz and can be custom printed in quantities 50,000 pieces. PE Coated inside and outside..
4 Colours to Full colour prints available. Printed with Food safe non toxic inks. Minimum 260 gsm boards used.